It has become a habit for many South Koreans to point to China as a thick haze of ultrafine dust descends and chokes the country, as well as to lash out at the Korean government for failing to settle the issue with its giant neighbor. Blaming China for worsening air pollution does not help the country’s fight against ultrafine dust, however, as a large amount of toxic particles are produced at home, according to Frank Rijsberman, director-general of the Global Green Growth Institute. “Blaming China is the easy way out. I agree China bears responsibility, but the case to negotiate with China would be so much stronger if the action at home was strong,” he said in an interview with The Korea Herald at the GGGI headquarters in central Seoul. South Korea has been grappling with massive air pollution especially from winter to spring. It ranks bottom in air quality among 35 member states of the Organization for Economic Cooperation and Development. The Korean government estimates up to 80 percent of PM2.5 ultrafine dust -- the airborne particles of diameter less than 2.5 micrometers -- in Korea flows here from China when concentrations of PM2.5 are heavy. While it is true China significantly contributes to air pollution here, the neighboring country took “drastic measures” to cut levels of the toxic pollutants, he pointed out, by closing down coal-fired plants and adopting more electric buses. China slashed its levels by almost a third on average over four years, according to a study. The Korean government takes “emergency reduction measures” -- such as banning old diesel cars from streets -- to cut emissions produced domestically. It also has conducted artificial rain experiments and is seeking to install large air purifiers in cities. But the measures are only “first baby steps” and “not enough,” and there are no “magical solutions,” the Dutch director-general noted, other than rapidly reforming industry heavily reliant on coal and nuclear power. “Transition from coal to renewables can go much faster. (The goal of increasing the share of renewable energy to) 20 percent is very good, an important policy switch for the Moon government. But not really enough,” he said. In 2017, the Moon Jae-in administration unveiled a plan to increase the share of renewable energy for power generation from 6.2 percent to 20 percent by 2030, and to reduce the dependence on coal power from 45.4 percent to 36.1 percent. It also plans to dismantle 10 aged coal-fired power plants by 2022. Coal power is still the biggest energy source in South Korea, followed by nuclear and gas. 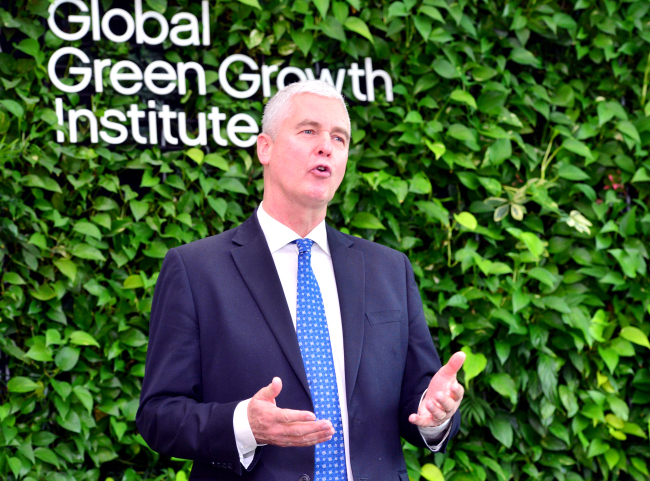 Based in Seoul, GGGI works to help developing countries achieve environmentally sustainable economic growth. The 31-member intergovernmental organization provides technical support, capacity building and policy planning on sustainable energy, greenhouse gas emissions reduction, water, sanitation and more.